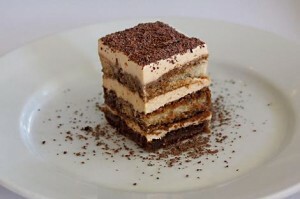 Classical tiramisù: craving for the right one! The most famous dessert in the world ? No wonder if the answer is “tiramisù”, absolutely great and pretty easy to make. Its origins? It traces back to the 17th century, coming from the fantasy of an unknown artist and chef of Siena (Tuscany) for the occasion of a visit by Grand Duke Cosimo de’ Medici III. The dessert’s name was at the time “zuppa del duca” (that is, the “Duke’s soup”). Instead today everybody calls it “tiramisù” (literally, “pick me up”). Lift your hands if you have ever tasted it! Which version of tiramisù? Maybe the most traditional one involved the use of “savoiardi” biscuits: the classic recipe! But it is important to say that, in the last two decades, many fans and supporter of this incredible dish has experiment and found really tasty the use of “pavesini” biscuits. This ” dolce al cucchiaio” requires no cooking, but the coffee. 200 ml (7 fl oz) espresso coffee (cold) and cocoa powder just for dusting. Put the egg yolks into a large bowl and start beating it with a whisk; gradually add all the sugar. When the mixture is pale yellow and thick, add few drops of vanilla extract. Beat firmly for few seconds, add the mascarpone to the egg-sugar-vanilla cream and blend everything together. Dip the biscuits in the coffee (one at a time), for few seconds; lay the biscuits on the bottom of the dish. Cover the biscuits with the tiramisù cream. Start with the second layer of biscuits, same procedure, and then the third and fourth! Dip the biscuits in the coffee and complete the second layer of biscuits. Remember to spread the final layer with the cream and dust it with cocoa powder. Put the tiramisù in the fridge, leave it for 4-5 hours and serve it!!! This entry was posted on Friday, June 3rd, 2011 at 2:11 pm	and is filed under Italian Recipes and Food. You can follow any responses to this entry through the RSS 2.0 feed. You can leave a response, or trackback from your own site.